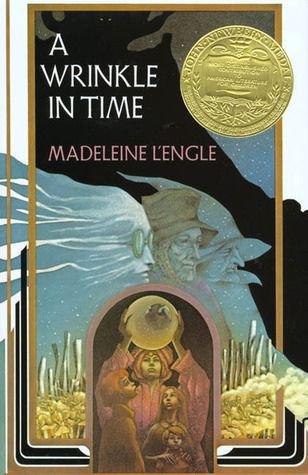 My 8 yo daughter and I finished yesterday, A Wrinkle in Time, the first book in a series by Madeleine L’Engle. As I mentioned in Goodreads, Sci-Fi is definitely not my favorite genre -and this story has its good share of it- because I find it hard to get immersed in the story, to get lost with the characters, to believe I am in it. However, this was the first time my daughter read this genre and was immediately caught up by the story. As I read aloud to her I could see her full of excitement as if she were traveling through time, from planet to planet along with the characters. She was not looking from afar but felt as if she were part of the story. At the end I can say that we had a great time reading it, and we were able to find many important places to just stop and talk about the truths this story contains, the lessons we must learn and the pitfalls we must try to avoid in life. Madeleine L’Engle said once, “You have to write the book that wants to be written, and if the book will be too difficult for grown-ups, then you write it for children.” I guess she is right. I wish I were more childlike at times. Now if you have read the story you can keep on reading (there are some spoilers ahead). As I was reading I found a resemblance between the planet Camazotz, (a planet in which you may recall all was peace, equality and order, but in which individuality was lost and everyone’s will was subject to IT, a greater power that controlled all the inhabitants of the planet), and the world in which we live today. Many today have stopped thinking and have bowed down to the god of Tolerance in order to achieve some kind of peace, equality and order. IT had control over people in Camazotz, just as Tolerance has taken control over the thinking faculties of people in our day. “Tolerance” has become, in a sense, the IT in our planet. Tolerance is the god many are serving blindly. The saddest thing is that this god Tolerance has found a niche in the heart of many Christians. They cannot see, they are frozen, they think just as Charles Wallace reasoned, that they can come inside IT and be part of it and not be absorbed into it. We cannot compromise; if we tolerate sin we will soon be absorbed by it. We have not been called to seek “peace, equality and order,” but to seek the Kingdom of God and His Righteousness. We, as children of God, have been called to hold fast to the Word of God, to fight the good fight. We must resist. Mr. Murry and Meg won over IT because they fought it thinking differently. As Christians, we know we don’t win the spiritual battles with our minds, but in a sense we do. What we think is what we believe. And we know that what we believe is what we act. Just look at how many times Paul in his epistles calls us to have the mind of Christ, to think, to reason. He urges us not be conformed in our minds to this world, but to be transformed in our thinking. Christians must start thinking accordingly to the Word of God at all times, in all circumstances. If we don’t, we will soon be absorbed into the world. There must be a clear, distinctive difference in how we see things and how the world sees them. We have the Bible as our standard, they don’t. At the end, in L’Engle’s story, love wins. But it doesn’t win the heart and mind of all that have been enslaved in Camazotz. I liked that. Love wins the heart of the one special person that, from the beginning we knew had to be rescued. Love always finds its way through the deepest darkness into the hardened hearts of men. Now I must to go, my little one wants to start reading the second book in the series, A Wind in the Door, so here we go. This entry was posted in Books, Classical Education, Homeschooling, My_Thoughts by Becky Pliego. Bookmark the permalink. An awesome answer to prayer is always that we and our children would grow so entrenched in the Truth that we can always spot the counterfeit, the idol, the It. And I'm glad that you are willing to explore the imperfect, safely within the perfect. And I am glad that you can enjoy a good book and the Truth that cannot fail because it runs so very deep! Love and hugs!